I'm telling you: There is no good reason why I keep winning blog giveaways! I enter because the item is something I would appreciate and use and don't have, and I only ever enter when it's easy and fast. But I never expect to win. When I do I feel like I've got to keep the goodness going. That's 2010 for me -- the year of keeping goodness going. I recently won a giveaway on the sweet blog Carrie Girl. Carrie offered a copy of Cal Patch's Design-It-Yourself Clothes book (which I promise to review after I've made a pattern from it and sewn up the garment), and I WON!!! 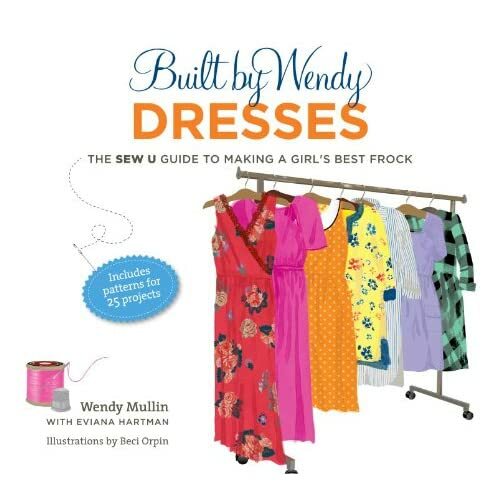 Immediately I felt I needed to keep the goodness going, so I emailed Carrie herself and asked if she had a recommendation for a hip, hot, new sewing book I could offer as a giveaway item, and she suggested Built By Wendy Dresses: The Sew U Guide to Making a Girl's Best Frock. I've never seen or read this book, but Wendy Mullins' Sew U was possibly the very first sewing book in my library from my early days learning to sew clothes, and it is really an exceptional sewing book. Which gives me faith that this new one will not disappoint. And you know how I love my dresses! It would make me so happy to see another dress lover win this book! The book is released for sale tomorrow, so let's end the giveaway and pick a winner tonight at midnight CDT. I'll announce the winner tomorrow morning and hopefully the book will be on its way to the winner, stat. HOW TO ENTER: Leave a comment describing the dress of your dreams -- the dress you'd make if you had the skills, the fabric, the time, whatever -- and your email address so I can contact you if you win. Good luck! How great of you to host this giveaway! I'm a Wendy fan since the first book. Right now I've been dreaming of making the perfect maternity dress: one in corduroy, for winter, and one in cotton, for summer. Ooh, great giveaway! Now, let's see . . . the dress of my dreams, eh? Well, I have 4 yards of the most amazing coral silk organza that I would love to make into a full-skirted 50s style dress. With couture touches like handrolled hems. And an underlayer of matching 4-ply silk crepe . . . the really expensive stuff. Okay, now you've got me going! What a fun, creative giveaway! I think I'd like something with an empire waist, sweetheart neck and 3/4 length sleeves. I'm picturing a nice lightweight knit with in a nice green for spring. I think a little pleated ruffle around the neck would be cute with a pleated ruffle on the hem and sleeve edge would be cute too. Hmm... I think my perfect dress would be a pattern I could adapt to many uses. But what I would use most would be a good sundress. Something with just enough stretch to fit well at the bodice, without being drapey/clingy in the waist-hip area. An empire waist, some ruching or pleats at the bodice, and those light slightly frilled cap sleeves that are really just straps with a longish loose ruffle draped over the shoulder. Maybe a robin's egg blue, or grassy green, or perhaps a floral involving both, with a tiny bit of red or pink. Then I would have the perfect thing to wear to all the weddings that seem to be happening every summer! Ah! If I could make it, my dream dress would be a simple sleeveless dress with princess seams...it would be knee-length and made of navy blue silk (or satin? ), completely lined and with hidden pockets along the seams...Maybe some nice detailing on the neckline...then again with my beginner sewing skills, i'd be happy with any dress that i could make from scratch successfully! okay: this is easy. I would make a dress that I would actually WEAR. Because I seem challenged by dresses--they are always too frooffy or too uber-girly or too matronly or too something. And I have knee insecurity too. But I WANT to be a girl who wears dresses. Especially because I am now surrounded by all this unbelievably cool thrifted fabric I've been gathering like a rat waiting for winter. It seems clear at this point that I'm never going to find something in a store. I think I've got to go with retro style to feel at home in it. Still, I don't remember wearing a dress I felt like myself in since . . .right. I don't remember. (Don't make me show you my prom pics.) I want to wear them, tho. I really want to. My dream dress would be a knit wrap dress made of some luxurious fabric. It would fit perfectly, have the perfect sleeve length & the perfect hem length. It would look amazing on me & I could wear it pretty much everywhere. What fun! I'm dreaming of making a wrap dress that doesn't gap, out of a knit. I'm terrified of knits. I could also use some well-fitted sundresses, however, for running about in the summertime. You know how I adore a good dress! I would like to make a forties style swing/shirtdress for the spring. ok, so i got too excited and forgot to describe my dream dress! here it is: small floral or polka dot print fabric, sweetheart neckline, fitted top with a-line skirt, pockets, vintage buttons. i don't think i have the skills to make this dress yet, but someday! Thanks for the great giveaway! The dresses of my dreams lately involve bows with an almost architectural feeling to them. I'm not quite ready to pull that off yet, though! Ooh, I'm having fun just reading about everyone else's dresses!! I'm not sure I can stick to just one dream dress... Right now I am dreaming of a sweet shirtwaist with a flared skirt - but that may be because Colette patterns Ceylon is sitting on my sewing table. I've wanted to sew myself a shirtwaist since I started sewing, and for some reason I haven't. Maybe this book would give me the kick in the pants I need! I love your blog, by the way. Your men's shirt transformations are inspiring! It would have to be a full-length evening gown in a blackcurrant silk. It needs to be sleek and glamourous with an interesting neckline for my dress clips to adorn. Just the sort of dress i can't justify making at the moment so it will have to exist in my dreams -for now anyway..! Wendy's previous books got me to push my boundaries with sewing. And I've been looking forward to this new release. If I felt up to it (skills wise) I would sew a dress that would work in a semi casual work environment where I do lab work. You know be dressed up without looking over done. I would like it to have some waist emphasis but not be constricting. A shirt dress with a twist may fit the bill. I would love to own this book. I'm just getting back in touch with my sewing machine (and I can't say I had a whole lot of skill where we left off). My dream dress is 1950s with updated structural accents...I'm thinking a full, girly skirt, the top with a ruffled collar and maybe a bow at the waist. I like the idea of pretty sky blue with a fun lace peeking out the bottom (maybe bright pink?). Dress of my dreams is a 40s evening dress with 3/4 length sleeves, with draping at the hip and some sort of fancy-fication at one shoulder, in light-weight navy blue wool crepe. I love to go out and dance - most of our events here are in the winter and I hate to freeze. My dream dress would be a white casual/dressy sundress. I'm getting married this year and I want to keep it nice and casual. It would have a nice, form fitting bodice and then it would go down to semi circle skirt. I've been dreaming of this dress!!! But I haven't found any pattern that I like yet! I have entered so many contests lately, but I haven't won any!! LOL! How generous of you! I have the Cal Patch book, too, and it's great. I made a skirt and a bunch of refashioned t-shirts (that I plan on blogging about. . .someday!). I'm dreaming of a comfy stripey knit dress, perhaps with a boatneck. I have both of Wendy's other books... they taught me how to sew! My dream dress would be a 1950s style gown with strapless bodice (that would actually fit me) and a circle skirt, made of beautiful silk taffeta. I would, of course, have somewhere to wear it to! I want a shirt dress that fits perfectly through the shoulders and sleeves, skims my waist and has flattering princess darts, and flares into a big full skirt, maybe with a petticoat underneath. An exaggerated lapel. And a top button that falls exactly where it should on my bust. Oh, and in a beautiful woven cotton with a pretty firm hand, but still lots of drape. And lovely royal blue. Is that too much to ask? A yellow sundress, I think. I'm super new at this, so I don't even have the confidence to dream! 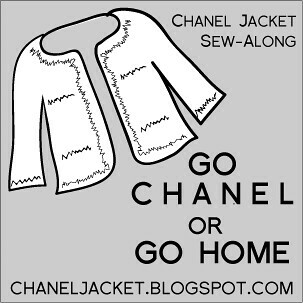 I've taken the refashion pledge and I'd like to make a cross over dress that actually fits over the um, bust region! I've always wanted to make my own wedding dress, but then I was married before I knew how to sew. I would love to design and make one with all the bells and whistles. :) Hehe. Thanks for the giveaway and it was so nice to meet you! Email is ang.m.so@gmail.com. Mine dream dress is the one I ACTUALLY saw in a dream. My wedding dress, and I'm delightfully, pregnantly huge (I'm not pregnant... yet.) The best of both dress worlds, wedding and maternity. White knit and a Bateau neck with 5/8 sleeves. One you can wear barefoot with your hair ina messy bun or with heels and a French twist. Simple like me, yet versatile, like me. My dream dress (right now) would be something floaty, frilly, flowery, and summery. Anything NOT to do with snow. The dress I would make if I had the skills and the materials would always be Audrey Hepburn's wedding dress in Funny Face. Each time I find a picture of it, I'm amazed by some detail I hadn't noticed before, from the corseted waist to the stiffness and specific shape of the skirt. I would probably make it a color other than white and would add a lace overlay. There is a particular picture I have from a 1990s Vogue that shows a autumnal colored mini tarten under a lace dress that would be my inspiration for the fabric choices but the shape would still be Givenchy! My dream dress has short sleeves, fitted bodice and flare skirt. I will make the top out of stretch fabric for comfort and the skirt part out of woven. I like the way a 100% woven skirt swishes around my legs. Oh so cooling and feminine in the summer. Knits will tend to cling...I guess my challenge will be to make it and have it still look like a one piece dress since I will have to deal with 2 different types of fabrics. Firstly, thank you for producing such a beautiful and inspiring blog, and for posting so often, despite whatever else is going on in your life. I appreciate your work. I also appreciate your 'giveaway' philosophy. I rarely if ever comment on blogs, and never for competitions, because I live so far away (Australia) and never want people to feel like after being so generous in the first place that now they have to shell out for mega-postage. Your post was so thoughtful that I really wanted to comment, even without a real hope to win, although this book is on my 'to buy' list. Secondly, my dream dress would be a shirt dress with a beautiful full skirt to my knees. It would fit me perfectly, without gaping or pulling (something that I can never seem to avoid). I would use a duck-egg blue fabric in something that avoids wrinkles but is still a natural fibre (imaginary, i know). It would have gathered cap sleeves to hide the way my arms are a little flabby at the tops. Very specific, but I hope one day I can pull it all together enough to at least attempt it! My dream dress(es) are all beyond my skill level for now. Nevertheless, it would be a teal silk off the shoulder 50's style dress with a full skirt. I would make a cute shirtwaist dress in a breezy summer print. One that makes you want to twirl around. The dress of my dreams would flatter my figure, making me look both taller and slimmer. It would suit my skin tones, and make me look younger too. People would stop me in the street to tell me how beautiful it is. At the same time it would be comfortable and cool to suit the weather here in Australia at the moment. It would be wrinkle free and machine washable. I really, really hope I win, so I can make this dress myself! I've been so exciting about that book coming out! The dress of my dreams would be a 1930's style silk dress, maybe a Vionnet. Sewing with slippery fabrics is still pretty challenging for me, but I guess the only way to get better is to sew more. The dress of my dreams is made of wool crepe, fully lined, in a nice charcoal gray or navy. I would like bound buttonholes and a matching jacket. I have so many problems with a dream since I am at least 3 or 4 different sizes in a dress. My neck/shoulder area is one size, bust is another, waist is another and the hips fall into another different size. I want a dress that fits me well with all of my sizes. I want to make a tie front dress with a not quite empire waistline and a slighty gathered skirt. Kind of like the Mociun style, but fitted for my petite self. How exciting!! I just love dresses and have been considering this book since I heard about it. I'd make a dress with a great print, long sleeves, a flattering waistline, maybe out of a knit jersey, with some ruffles around the neckline or hemline, or both! Oooh, I so want to win this! I never win blog giveaways! I would make a red shirtdress with 3/4 sleeves and belt. I saw one in Land's End today and I thought it was just so elegant. My wedding dress! The hub and I are tying the knot this coming December, and I want to make my dress. Tea length, strapless with a lace caplet in a luxurious satin, probably off-white/ivory, with a colorful satin or silk tie at the waist. Simple at best I know, but my dream dress is a classic wrap - a great fitting Diane Von Furstenbergy knockoff made by me of course made in a striking print polyester knit. Hows that for a long sentence and a newly made up word? What's keep me from it??? I need to make that my next project. Please enter me in your contest - fayedoll@cox.net. My ultimate dress would be one from a flowy/satin material that I can wear formally or informally. Honestly, I am not one for wearing dresses, really, but I love dressing up to go out. I would like to be able to make one that suits my skinny frame, flattering the 'good bits' that I have left! The dress of my dreams... A retro-style shirtdress with buttons all the way down the front and a full skirt falling off a very fitted wasteline. I'm so intimidated by buttonholes right now. I need to face my fears sometime soon! Thanks for the giveaway. ooooh! you know i want to get more into dresses :-). hm ... i'd make something with princess seams probably ... and maybe with a peter pan collar ... though not necessarily together. And navy with polka dots. Actually, really what I want to do is figure out how to use bits and pieces of my random quilting fabric in a way that doesn't look totally random and homemade on a dress, if you know what I mean. Like things like really cute Japanese fabric that doesn't translate well to armhole bindings and the like. Let me know if you figure that one out ;-). Oh, I'm so excited to see this book -I hope I win! I would love to make a dress with a knit that is super comfy, super cute while being classic, and makes me look thin! Faye Lewis and I share the same dream. I would love to sew the perfect wrap dress, yes a Diane Von Furstenberg classic. My fabric choice would be a gorgeous silk jersey print. This dress would not gap or bag but fit me perfectly. Ahh to dream. Thanks for doing this - pick me! pick me! Hmmm, dream dress...A long-time dream of mine has been to sew my own wedding dress--to somehow find the perfect balance between casual, fun and at least a little elegant, some kind of splash of color, and a corset-laced back. But since I don't even have a boyfriend yet, that one's going to have to wait! For a more everyday one, you know I'm still trying to sort out my style, but I think I'd go for a great knit sleeveless wrap with a drapey flared skirt, in either a silk jersey or a silk-bamboo blend. Maybe two--I could do one in black (if I'm going to have an LBD, I want it to be a casual one I can wear a lot), and another in some crazy blue and green print! Is it too late to enter? I only just saw your post and it's 7.20pm on Tuesday evening New Zealand time. What's that in Texas time? My dream dress would be in a bright teal, violet or emerald green silk, with a trapezoid neckline (or maybe a portrait collar) and cap sleeves, knee length but with some kind of ruching at the sides so that I can adjust the length - shorter when wearing with tights, longer when go bare-legged. Empire waist, multiple top-stitched darts at side of bust, and with piping all over the place in a contrast colour - probably a complementary one. And in-seam pockets. I was lucky in the my wedding dress was my dream dress. Now my dream dress is one that would make me feel that good. But a basic requirement is a boned bodice or corset on something historical in flavour, maybe 16th-17th century.